NWCI offers a complete line of pop up displays for any size trade show booth. Our line of pop ups covers all price points and quality requirements. Most of our pop up displays are made in the US and are all shipped within in the United States. Our Coyote pop up frames carry lifetime warranty's and the Economy line has a limited lifetime warranty. We only sell displays we have tested and would purchase ourselves for shows. NWCI offers extremely low pricing on all or our pop up displays in order to bring great trade show displays to companies who are on very tight budgets. Why Choose Pop Up Displays? Quick Set pop up displays are very easy to set up and even easier to transport because they are very lightweight. These displays are available in multiple shapes and sizes to fit any trade show booth! The 3d Snap displays are the high end displays in the Geometric series. The 3D Snap displays are configurable with easy to change graphics! There are an infinite amount of configurations available! Choose a standard kit or create your own! 3-D displays are the newest addition to the industry. Stretch graphics and unique styling make these displays a step above a standard pop up. Easy assembly and low prices make these displays a great option. HD Coyote pop up displays include Lambda mural graphic which are ultra high quality graphics that are similar to High Definition television. 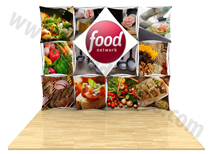 There are multiple sizes available for any marketing or trade show event! One Fabric pop up displays are very easy to set up and even easier to transport because they are very lightweight. These displays are available in multiple shapes and sizes to fit any trade show booth! Hop Up Displays set up quickly and easily using a high quality Orbus frame with a Lifetime Warranty. NWCI offers multiple sizes and complete kits so you can find a Hop Up display that is a perfect fit! These pop up displays include graphic mural panels. They are full height panels that replace the typical fabric panels for a unique and professional look. 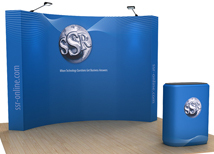 We have multiple sizes for any trade show booth! These pop up displays come with carpet like fabric panels that are designed to accept Velcro graphics! There are economy and premium lines available as well as multiple graphic packages! Our Big Wave pop up displays for trade shows are a great option for exhibitors who are on a tight budget but would still like to have a quality display. These pop up booths are quality controlled in the USA to insure you get a quality product for your show. We have options for full mural graphics and detachable graphics to market at your next show. All mural panels are printed on a 19 mil pvc graphic that will hold up for years. Standard graphic printing is done at 600 dpi and the images come out looking very clear. 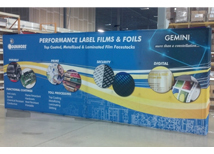 We also offer lambda large format graphics for exhibitors who are looking for the sharpest graphics in the industry. The Arise pop up display is one of the strongest pop up trade show displays available in the market place. Thick aluminum tubing and solid hub connection points make this display very strong and durable. This display is recommended for exhibitors looking for a display that will last years and will be very easy to assemble and ship. The slightly heavier frame makes this display kit about 15 lbs. heaver than other options but will last for much longer. The individual magnetic channels make this display very easy to assemble and break down. High quality 20 mil graphics are used to create a spectacular back wall graphic display. Our Hop Up Display is a product that utilizes the Orbus Hop Up frame and uses a custom fitted graphic from a premium G7 print shop. We offer the Hop Up in many different shapes and sizes to fit any size booth. The main difference between the OneFabric Displays and the Premium Hop Up is the heavy duty Orbus Hop Up frame which has a lifetime warranty and is extremely durable. This stretch fabric system uses a seamless graphic that remains attached to the frame. This makes the Hop Up one of the easiest booths to assemble. The HD Coyote pop up display is one of the highest quality pop up packages available in the industry. It utilizes the high quality Coyote pop up display frame and comes with high quality Lambda graphics which are the highest quality large format prints available. 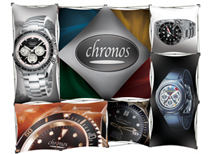 This display system is specifically designed for customers looking for the best of the best. The frame is the best on the market, even stronger than Skyline and Nomadic pop up display frames and the Lambda printing is the highest quality available. The Coyote display system even has optional internal shelf kits that can be used to display products with the display frame to keep everything clean and professional. 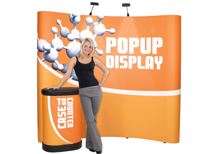 This is one of the best portable pop up displays on the market! 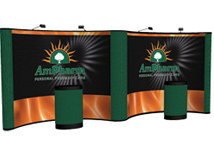 Pop up displays are typically used for trade shows. They also work great for marketing events, job fairs, and conferences. Pop ups are ideal when a large graphic backdrop is need, from three feet wide to 40+ feet wide, they can be configured for almost any booth space. The low cost price point and versatility make this a great option for exhibitors looking for an eye catching display that is affordable and easy to assemble. Our article on trade show pop ups covers this production line in depth.